Culloden. Few words provoke such a range of emotions if you’re a Scot. They can range from anger, sadness betrayal, disbelief and a feeling of what might have been! But there are also the personal tragedies, men who died bravely for a cause that they believed in although some of us can, with modern eyes perhaps see the futility of the battle of Culloden, we can and should however remember the personal bravery of the men who were caught up in the tragedy that was Culloden. 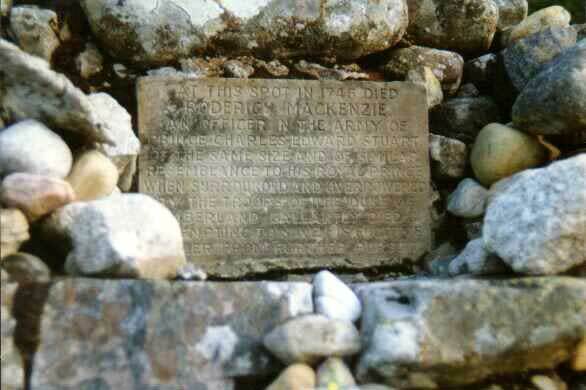 One such man was Roderick MacKenzie. Never heard of him? Charles Edward Louis Phillip Casimir's attempt to put a Stuart back on the British throne ended in what can only be described as a shambolic and total failure at Culloden on April 16th 1746. The victorious Duke of Cumberland set out on a relentless mission to hunt down and destroy any Jacobite support among what was left of the beleaguered clans, earning himself the nickname 'Butcher Cumberland' in the process. Bonnie Prince Charlie had a price of £30,000 on his head and anyone caught harbouring this enemy would be subject to instant execution! Despite this, many people did indeed protect the Prince without a thought for their own safety. One such man was Roderick Mackenzie the son of an Edinburgh Goldsmith and jeweller, a Burgess of the city who, although not part of the 1715 rebellion, was a staunch Jacobite. Young Roderick preferred a travelling life and is entered in the Roll of Edinburgh Burgesses dated 15th February 1744 as a Writer and Merchant, having inherited the Burgess-ship on the death of his father. Roderick managed to bring some invaluable traits to the Prince’s party. Because of his close resemblance to the Prince he became a personal bodyguard to his Royal Highness. In such a role he became invaluable as a decoy, and he also possessed an intimate knowledge of the remoter Scottish countryside, borne out of a lifetime living within it. It is very probable that Roderick himself was at the Battle of Culloden as part of Elcho's and Fitzjames' Horse which allowed much of the Jacobite right wing to escape the battlefield. After Culloden Roderick dared not return home to Edinburgh to be with his widowed mother and sisters who stayed at Gray’s Close in the High Street, but instead fulfilled his role as a decoy for the Prince, a role that would ultimately result in Roderick's last great act of bravery. There are varying accounts of Roderick’s final day in late July 1746. Prince Charlie and a few close and trusted supporters had been laying low for a few days up Coire Dho at the head of Glen Moriston in a cave with no retreat to the rear but ample views of the glen and any Redcoats who may be in the area. It was here that it was decided that Roderick would dress as the Prince and allow himself to be visible to the Redcoats and draw them away from the Prince towards Ceannocroc; he managed to lead the Redcoats eight miles away from the cave. 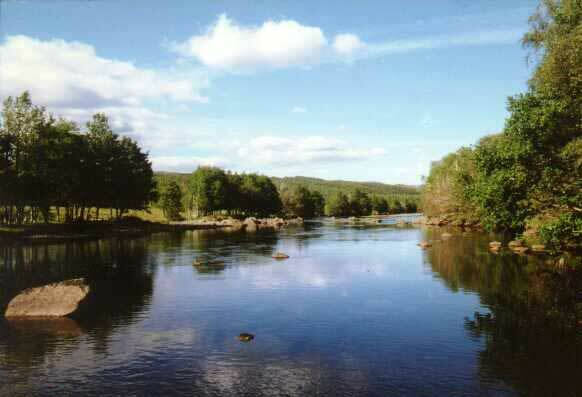 Other sources say that Roderick was in fact already down by the burn below Ceannocroc when the Redcoats surprised him and immediately mistook him for the Prince. Whichever source is to be believed, when finally escape was not an option, Roderick turned to face the Redcoats and drew his sword refusing to be taken alive, the ” brave” Redcoats thereupon riddled him with bullets, and he expired with the words on his lips, “You have murdered your Prince!" This selfless act of bravery convinced the Hanoverians that they had at last caught Prince Charles Edward Stuart himself. To quote from 'The Lyon in Mourning' collated by Bishop Forbes in the years following the Battle of Culloden." Mrs Jean Cameron says that Roderick so far deceived them that the Duke of Cumberland went up directly to London in full persuasion the thing were done." Again quoting from the 'The Lyon in Mourning', Mackenzie fell by the side of the public highway, opposite the lands of Ceanacroc. A cairn marks the spot. 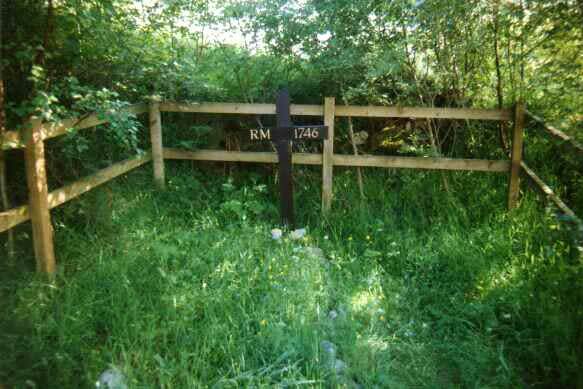 The grave in which the headless body was hastily buried lies on the opposite side of the road, and by the side of a small stream called, after Mackenzie, Caochan a' Cheannaich the Merchant's Streamlet. Near it was recently found a sword, probably Mackenzie's. Without any good reason, doubt has been cast on the story by Mr Robert Chambers and Lord Mahon, neither of whom, probably, ever visited the scene of his death. In the story, it is related, the soldiers roamed up and down Glenmoriston, shooting down men, burning homesteads to the ground, stripping women of their clothes, and driving to Fort-Augustus every four-footed animal they could find. Maids and matrons were seized and violated under circumstances of gross brutality. The terror-stricken people fled to the mountains where many of them succumbed to hunger and exposure. Such of them as ventured to the Fort to beg for food were denied the crumbs that fell from the soldiers' table, and were sent away empty by Johnstone (Memoirs) and in the Lyon in Mourning by Macpherson of Cluny, and Mrs Cameron, wife of Dr Archibald Cameron the last Jacobite executed. These all lived at the time of the event. And at this time durst not be seen. Him the soldiers lighted on. You had no orders thus to do." 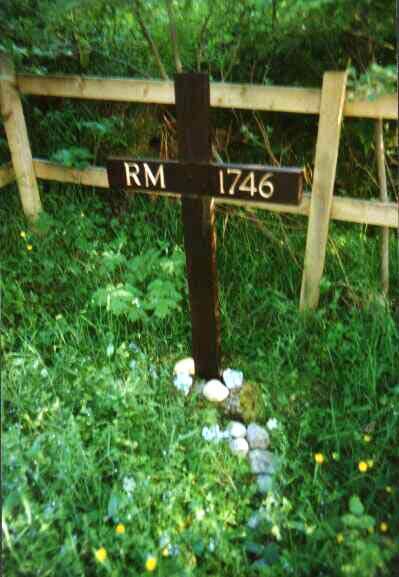 There is no doubt that Roderick's noble sacrifice allowed the Young Pretender many more valuable days to escape from being trapped in Glen Moriston where he would have most certainly met the same fate. One of the bravest deeds of the '45 and hopefully you’ll agree, one who should be remembered as a brave man, an unselfish man and a hero. We'd Like To Thank The Hendry Family for inspiring this history lesson, thanks guys.